The gauge marks on the main scale and the gauge marks on the vernier scale are related in a defined ratio to each other, in our example here it is a ratio of 9:10. This means that the distance between two marks on the vernier scale is 0.9 mm and on the main scale it is 1 mm. This is the trick which makes sure that by sliding the gauge you always get a gauge mark on the opposite side on the vernier scale. So it is made sure that the sum of the measuring is a value combined of measuring and adding the value shown on the vernier scale as a multiplicator of 1. When there is a fraction of 0.1 mm the 1 appears on the vernier scale (i.e. 0.1 measured value + 0.9 mm is a distance between two gauge marks on the vernier scale). Referring to a fraction of 0.3 mm i.e. a measured value of 0.3 mm + 3 times 0.9 (0.27 mm) the sum 3 will be shown on the vernier scale. 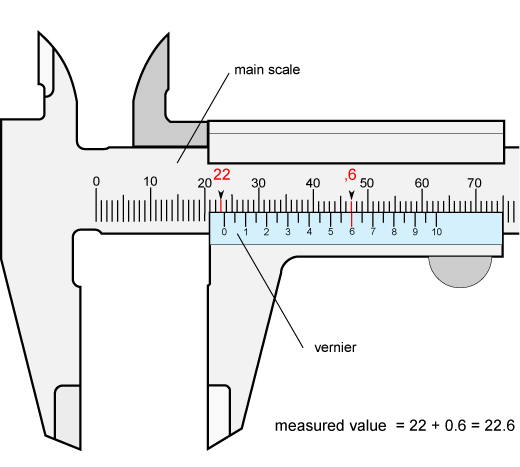 The vernier scale doesn’t relate always to a ratio of 1:10 of the main scale. The ratio can also be 1:20 or 1:50. A vernier scale of the ratio 1:20 has 20 gauge marks in a distance of 0.95 mm, a vernier scale of the ratio of 1:50 has 50 gauge marks with a distance of 0.98 mm from mark to mark. The basic principle of measuring stays always the same. 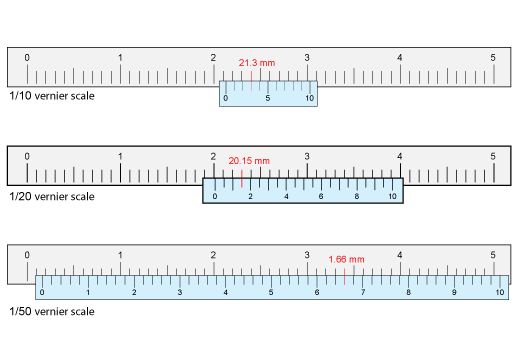 You only have to consider that in case of a vernier scale with the ratio 1:20 the measured value is a multiple of 0.05 mm which is shown with a distance of 3 gauge marks. In this case 3 gauge marks on the vernier scale add to the sum of 3x 0.05 mm= 0.15 mm. 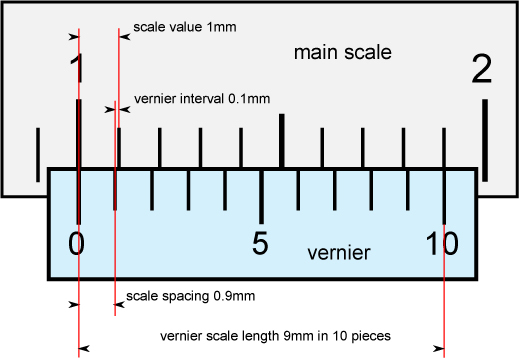 Three gauge marks on a 1:50 ratio vernier scale would give 3x 0.02 mm= 0.06 mm. The precision of measurement is impressing here, but with the normal human eye a limit is reached here by just being able to read these intricacies without special lenses. For this reason a high quality digital instrument instead of a slide gauge is much easier to read because of the LCD display. It is important to mention however that measuring errors appear by holding the moving jaw tilted out of parallel with the fixed jaw either through force or lack of straightness in the reference edge of the beam or through deformation of the material of the instrument itself by age, temperature or wrong use. This error might be higher than the value on the vernier scale. A precision of measurement of +- 0.02 mm is reached only by a few very welltrained practitioners, but this precision is independent from the use of the traditional slide gauge with a vernier scale or the digital Vernier.